Smarter, stronger and more intuitive than ever, LEGO MINDSTORMS NXT is a robotics toolset that provides endless opportunities for robotics enthusiasts and LEGO builders of all ages, genders and academic experience. Originally offered for retail sale in 1998, the next generation, LEGO NXT was released in 2006 with curriculum packages developed by Carnegie Mellon, Tufts University and Vernier Software. Robot Hall of Fame Juror Illah Nourbakhsh, associate professor in Carnegie Mellon's Robotics Institute, said the LEGO MINDSTORMS kit did more to take creative robotics to the masses than just about any other retail product." Building upon the success of the globally renowned Robotics Invention System, this next generation of LEGO MINDSTORMS makes it quicker and easier for robot creators to build and program a working robot in just 30 minutes. Simultaneously, new technologies and expanded sensor capabilities add a level of sophistication to excite and challenge more experienced robot creators. The heart of the new system is the NXT brick, an autonomous 32-bit LEGO microprocessor that can be programmed using a PC or Mac. After building their robots, users create a program within easy-to-use yet feature-rich software, powered by LabVIEW from National Instruments. Downloading programs to an invention is easy. The included USB 2.0 cable can be used to connect the computer to the NXT for program transfer. Users with Bluetooth®-enabled computer hardware can transfer their programs to the NXT wirelessly, enabling the possibility for controlling robots remotely from a mobile phone or PDA. The robot then takes on a life of its own, fully autonomous from the computer. 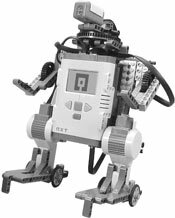 LEGO MINDSTORMS NXT has made robotics truly accessible to a broad audience of both children and adults all around the world. LEGO MINDSTORMS….For encouraging students to DO something with math and science – not just study it…. for enabling them to investigate problems and develop their own solutions…. and for helping kids to think robots are fun….LEGO MINDSTORMS we welcome you into the Robot Hall of Fame.